When a baby learns to come into the sitting positon on his own, it is a wonderful accomplishment! Watch Maddoxx in the above video from Jillybomb’s youtube channel. Notice how he is shifting his weight in many different directions while sensing where he feels secure so he can lift his torso a bit more upright. Slowly, over the course of the four minute video, he learns where to feel support for him to sit up. By bringing his pelvis down so it is more in contact with the floor, he is able to bring his head and torso more upright. Near the end of the video he is sitting up with his hands still on the floor. He is rocking back and forth so he learns to shift his weight toward the back of his pelvis so then he can sit completely upright. He does this successfully by the end of the video! While Maddoxx is experimenting with shifting his weight we can hear his mother in the background praising him with words specific to what he is doing. When he crawls just a bit she says, “I saw you just shuffle your knees.” It is as if she is holding his hand with her voice. She is with him every moment of the discovery of this motor skill through her encouraging words so he knows that what he is doing is good, safe, and that he should continue. At the end of the video Maddoxx sits with excellent posture and a big smile on his face. What a proud caterpillar, and a stellar one too! Please read our post “Why Babies Love Sitting Up” for more information on the motor skill development of sitting. “Grave Concerns about popular Baby Bumbo Seat,” Julie Deardorff, Chicago Tribune, 3/15/12. “Therapists See No Developmental Benefits from Seats,” Julie Deardorff, Chicago Tribune, 3/15/12. Recent articles in the Chicago Tribune examine the dangers and question the developmental benefits of the popular Bumbo Chair. With this particular design baby is forced upright in the sitting posture with both legs fixed in position so they can not move out of the chair. Baby has no choice but to be upright. The first Tribune article examines the very serious accident that can result when baby moves and the chair tips over. The second article refutes the benefits Bumbo promotes on their website. Developmentally, the forced sitting positon can lead to muscle fatigue and spasm. If baby can not get out of the sitting position when he is tired, which is the case with the Bumbo chair, the muscles spasm (tighten). Tight muscles makes it difficult for baby to articulate the movement of the pelvis for crawling, or to lay on the belly for tummy time. Muscles in spasm do not want to stretch or move. Parents need free hands. A much better developmental choice is the play pen (also called Pak N Play) because mom can have free hands while baby explores through her own movement. Parents like to see the baby is “happy.” Babies smile when they are at eye level with you. Rather than place Bumbo on the table, it is a better choice for their motor skill development to put them on the floor and for parents to get down on the floor with them. Go to their level so they can learn what they need through movement. Parents aim to develop good posture for baby. Rather than stabilize baby in a “trap,” allow her to strengthen muscles through movement and play. Putting baby on the floor and in tummy time better strengthens back and neck muscles for developing beautiful sitting posture. 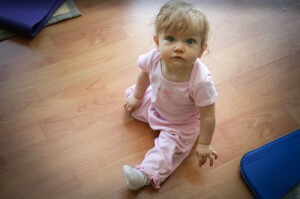 Through being given time on the floor to explore, babies develop motor skills. You can not force a rose to open, if you try you will rip it apart. Babies need time in each developmental stage. The design of their development is absolutely brilliant. Their brain is ready to fire the motor patterns of sitting and standing when their bones and muscles are strong enough to do so. When babies spend a lot of time on the floor and learn to lift their head while in tummy time, they sit with beautiful posture from the first day they sit. Their muscles and bones are ready. It should happen naturally. Madison, age 7 months, demonstrates one of the advantages of excellent posture. It is easy for her to grab objects and play with them and bring them to her mouth while sitting up. One of the most commonly searched developmental phrases on google is, “baby sits with curved back.” This is because many parents do not understand how to teach baby to sit. Babies do not learn perfect posture from being put in the sitting position at a young age. They have not developed the strength in their muscles and bones to hold the position so they collapse into a rounded back. Their parent often sits behind them with a hand close to baby’s back to catch her when she falls. To learn how to teach your baby to have beautiful posture, please read our posts on the topic (see links below). Through understanding how to strengthen the back and neck muscles and understanding that this process takes time, your baby will learn to sit up straight, too. Most important is to learn patience. Madison did not sit up until recently because it takes time to strengthen her bones and muscles. When she sat up for the first time, she had perfect posture. This is the experience of our Stellar Caterpillar students! Why Do Babies Love Sitting Up? In this photo essay, Madison (7 months old) demonstrates the various sitting positions included in the optimal gross motor skill development of a baby. When she learns these various sitting positions, her balance improves. They can be introduced once baby has learned to come to the sitting position from rolling. This is at around 7 months of age. In the top photo, Madison has rolled to a sitting position. From the rolling position, baby may arrive in a Z-sit, straight legs, one leg bent and one straight. There are several options. Balance is one of the skills learned from sitting. In previous posts, we discussed other benefits. Sitting frees the arms so baby can grasp and reach bigger and better toys. Sitting becomes a transition through which baby passes to go from one motor skill to another. For example, baby rolls from her back to sit before coming to stand. Sitting also develops the hip joint, which is important for the more challenging gross motor skills she will soon learn. While baby is sitting on your lap, gently slide her legs and feet into a position and hold them there for just a few seconds. This should not be forced. They should move easily and smoothly into the position. Your hands show her one of the many options of how she can arrange her legs and feet. With repetition she will begin to find these positions on her own. Eventually she will use them when she plays on the floor. Her balance is challenged in the beginning, but when she is on your lap you help her feel stable. Later, when she uses the positions on her own, you will know that her balanced has improved. When she begins to stand, cruise, and walk she will be quite stable because of this time spent on the floor learning these sitting positions. WHY DO BABIES LOVE SITTING UP ? This picture says it all…babies love sitting because they can play with so much more stuff…bigger and better stuff. At 7+ months Rochel demonstrates how a stable sitting posture enables her to play with much larger and heavier objects than she could play with while on her back or belly. The sitting posture frees the arms and hands so baby can eat or play. She now begins to learn how to open and close objects. She feels more independent as she can see what is happening around her. Sitting while grasping and reaching begins to involve movement in the hip joints, because objects are far enough away that she must lean forward to try and grasp them. We examined how babies develop sitting posture, and now we understand how the skill of lifting the head develops excellent sitting posture which enables baby to grasp and reach freely. One skill facilitates the next. This is why a stellar caterpillar goes through every stage of motor skill development, spending enough time in each stage to stretch and strengthen the appropriate muscles. When a baby does not feel comfortable in tummy time, it is difficult for her to lift her head. Without lifting the head, she can not develop strong back and neck muscles. The baby who has missed the stage of lifting the head sits with a curved spine and is not stable. 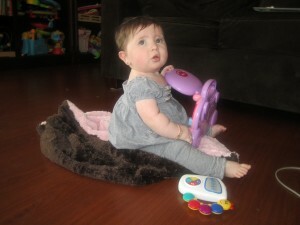 A poor sitting posture makes it difficult for baby to play with large objects, and she will fall over. In the development of a baby, the evolution of a sitting posture that provides stability and more independence is significant.